I normally use dimDate tables in my projects, but for this client it made sense to have this at the week level. Rather than sticking with my usual dimDate stored procedure to build out the table and attributes, I thought I’d take the opportunity to migrate the logic over to an SSIS package. Here is a quick overview of how it works. 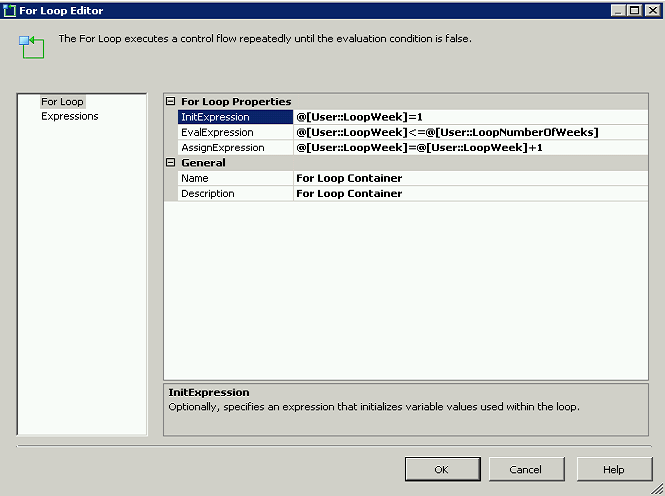 In my SSIS package I created 4 variables. Three of these variables will be populated by the package. Only the StartDate needs to be populated by the user. In this case the first date to be populated in the table is the first day of 2010. The tasks are fairly straightforward and the finished package looks like this. I wanted to blog certain parts of this, largely so I can remember them the next time I do this. This task is in place to ensure that the StartDate is set to the correct day of the week, as required by the business. This client has the start of their business week on Sunday. 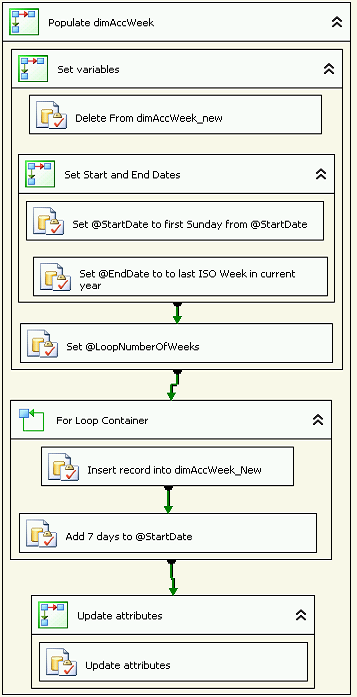 If the user has entered a date into the package variable which is not a Sunday, this task will set the @StartDate to the nearest Sunday after the date in the variable. The fact that the SQL Server DATEPART ISOWW starts on a Monday will be addressed later in this post. The CAST statement is added to allow the results to be inserted into the @StartDate string variable. The client wants the table to contain weeks up to the last week of the current ISO year. When we move into next year, the new year will automatically be added. You can edit this statement to meet your business requirements. The CAST statement is added to allow the results to be inserted into the @EndDate string variable. 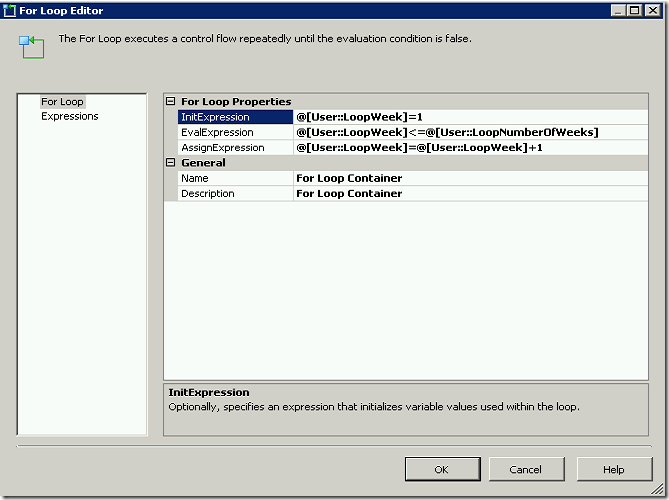 This will find the number of weeks between the StartDate and the EndDate for use in the For Loop Container. I added 1, because I chose to start my Loop at 1 rather than 0. The container is set to look through the number of weeks calculated in the Set @LoopNumberOfWeeks task. Note that the InitExpression is 1 instead of 0. I am using the @LoopWeek variable to populate one of the fields in my table, which is why I wanted to start with 1. 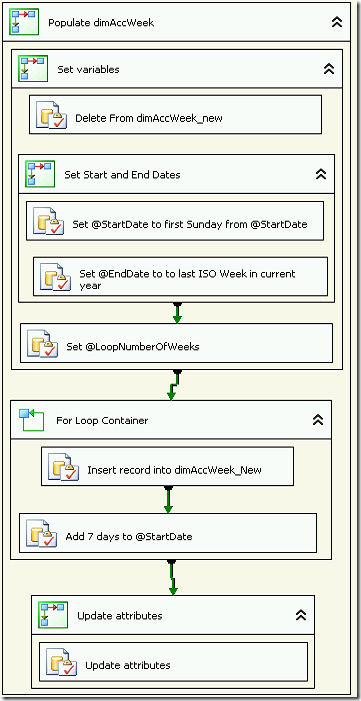 Instead of using the loop to move the date forward one week, I am updating the variable with an Execute SQL Task inside the loop. The CAST statement is added to allow the results to be inserted into the @StartDate string variable. You can add as many attributes as you require. This should get you started. Thank you! This is amazing. Very thorough and understandable. Appreciate your insight and also for sharing this.